Heavy use and abuse, water damage and vandalism are everyday issues in recreation property restroom and locker room environments. SCRC, engineered by Bobrick Washroom Equipment Inc., is for heavy-traffic environments and features superior non-ghosting graffiti removal, and scratch-, dent- and impact-resistance according to independent ASTM testing. Moisture-resistant, SCRC withstands hose-down maintenance and installation near swimming pools. A contributor to LEED certification, SierraSeries® SCRC also meets Class B ASTM E84 Interior Wall and Ceiling Finish Classification. To help save time and money on costly maintenance, Halsey Taylor offers the rugged yet attractive HVRTM Series with vandal-resistant features to accommodate even the most frequently used areas. The HVR Series is UL-listed for both indoor and outdoor use, meets both adult and child ADA requirements and is available in both single and bi-level options. 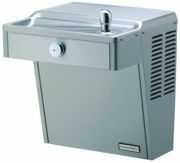 It features chrome-plated, vandal-resistant unleaded brass bubblers with integral hood guards to prevent tampering. Durable stainless steel on the cabinet and the cooler basin can withstand almost any rough handling, while also resisting stains and corrosion that can occur over time. Results of a recent independent nationwide study showed customers visit family-friendly establishments more often because of factors such as sanitation, maintenance, and child safety and comfort. Koala® Baby Changing Stations, essential for recreational property restrooms and locker rooms, are exclusively equipped with Microban® antimicrobial product protection, which inhibits the growth of bacteria. Constructed of high-density polyethylene with a smooth concave changing surface, Koala baby Changing Stations provide superior child protection, comfort and durability, and are fully ASTM compliant. Golden Mills Towels are priced to fit every budget. There are now five quality levels to choose from: Golden Camelot for budget clubs, Golden Jewel and Golden Cam for mid-scale clubs, Golden Touch for upper-end clubs, and Golden Diamond and Golden Elegance for spas and resorts. All towels are constructed to withstand the daily use and washings of athletic clubs. All towels are available in white, with select styles available in beige as well. Constructed of high-density plastic, Salsbury's water-resistant plastic lockers are available in single-tier, double-tier and six-tier box style, and in three attractive colors, gray, tan and blue. The plastic lockers are ideal for pool areas, waterparks and places with high humidity. Established in 1936, Salsbury Industries is a leader in manufacturing and distributing quality lockers. The organization prides itself in providing quality products and exceptional service. Products include Standard, Vented, Designer, Extra Wide, Open Access, Plastic and Storage Lockers. For a free catalog or additional information, visit the Web site. The new multi-purpose hand drying station (model 270) from Bradley Corp. features a towel dispenser, hand dryer and waste receptacle all in one streamlined stainless-steel cabinet. The tower-style unit is available in a choice of recessed, semi-recessed or surface-mounted options. The door of the multipurpose unit is fabricated of heavy-duty, warp-resistant stainless steel with a full-length piano hinge and two keyed tumbler locks to prevent tampering. The towel dispenser holds single-fold, multi-fold or C-fold paper towels and has a locking service door. The waste container has a capacity of 4.37 gallons. A sensor-activated hand dryer completes the all-in-one hand-drying station. Waterless Co. LLC was the originator of Waterless No-FlushTM urinals in 1991. Now Waterless Co. has introduced another simple solution to common restroom problems—floor drain odors. EverPrime®, the company's new environmentally friendly floor drain liquid seal helps keep dried-out floor drains from becoming odiferous. It prevents the drying out of floor drain water seals due to unprimed floor drains or primers that no longer work. EverPrime is fully biodegradable, long-lasting, and cost-effective and eliminates those bothersome and costly maintenance calls on smelly floor drains. Great for all types of floor drains, unused buildings, outlying areas and specialty applications. Smarte Carte Inc.'s family of Smarte Locke® electronic lockers are keyless and offer unmatched security, administrative and customer service features, while maximizing the opportunity for revenue generation. Operating modes and advanced options include multiple or single entry, cash or credit locker rental and PIN, RFID wristband or bar-code access. The multiple-entry feature gives guests convenient access to their personal items and wallets to encourage spending inside your facility. Smarte Carte offers an all-inclusive, revenue-share concession, where Smarte Carte provides the locker equipment, manages the service and shares the revenue with you.